Adobe 推出Flash 10.1 正式版了. 之前一直都是Beta, 今天Adobe 終於推出Flash 10.1的正式版, 大家快快去Market 上更新. 另外, Adobe 亦公佈其他會獲得Flash 10.1 升級的手機型號. 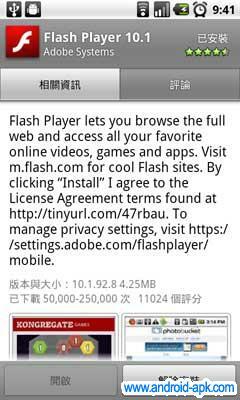 Flash Player 10.1 for Android (2.2) is now generally available as of August 16; we had previously released Flash Player 10.1 to partners in June 2010. We expect additional Android devices like the HTC Incredible, Samsung Galaxy S, Motorola Milestone, Droid X, Droid by Motorola, Dell Streak and other mobile platforms to get Flash Player 10.1 over the next few weeks and months.